As much as I personally complained about the majority of our summer weather, being a true Seattleite, I have forgotten all about it for the lovely weather we have had as of late. The back doors are open, a bonfire is sure to be in our near future, and s'mores and guitar playing will complete our evening. But first, a good summertime meal of grilled shrimp tacos. Heat a small fry pan until very hot. Add 1 tbsp olive oil and quick fry the onion until browned. Turn off fire and add garlic and toss to combine until garlic is fragrant. 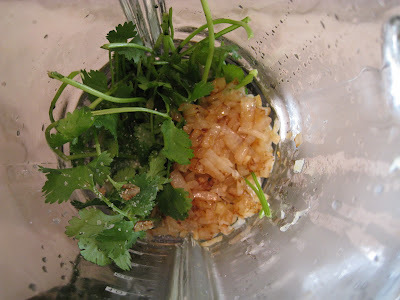 Combine with remainder of marinade in a blender and liquify. 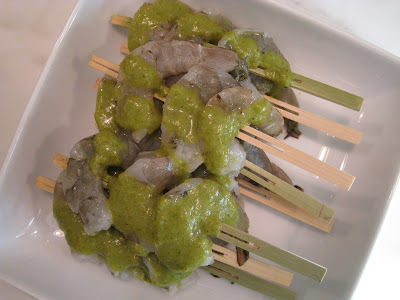 Skewer shrimp, pour marinade on top, cover, refrigerate for an hour or so. Chris grilled the shrimp on the gas Weber until just cooked through. Mix everything together in a large bowl and let sit, chilled in the refrigerator for 15-20 minutes. Serve tacos with flour or corn tortillas. We had both. A great meal for a beautiful night.